A recent contributor to the comments on this site accused the Ex-Christadelphians of having “simply exchanged a type of Christian fundamentalism for Atheist fundamentalism.” To make this kind of all too common sweeping condemnation shows that the writer does not understand the meaning of Christian fundamentalism, and has no idea of the simplicity and yet huge variety of Atheism. The “fundamentalist” movement in Christianity goes back to the early decades of the 20th century when after 100 years or more of biblical scholarship, textual criticism and the like it was becoming clear to Christian academics that amongst other things; the bible was not written by the people whom is was traditionally credited to, it was not inerrant, Jesus was not necessarily a historical character and was certainly not the miracle worker painted by the gospel stories. There was a rebellion amongst less sophisticated Christian believers who thought that this modern thinking was undermining the basis of the faith. They came out with a set of “fundamentals” which had to be accepted without question for them to consider others to be Christian. Fundamentalism was a rebellion within Christianity against the liberal educated elite. Of course over the years popular use of the word fundamentalist has changed the meaning of the word, and now it’s used of Muslims and Jews and others, but essentially it still refers to unquestioning assent to a set of beliefs. 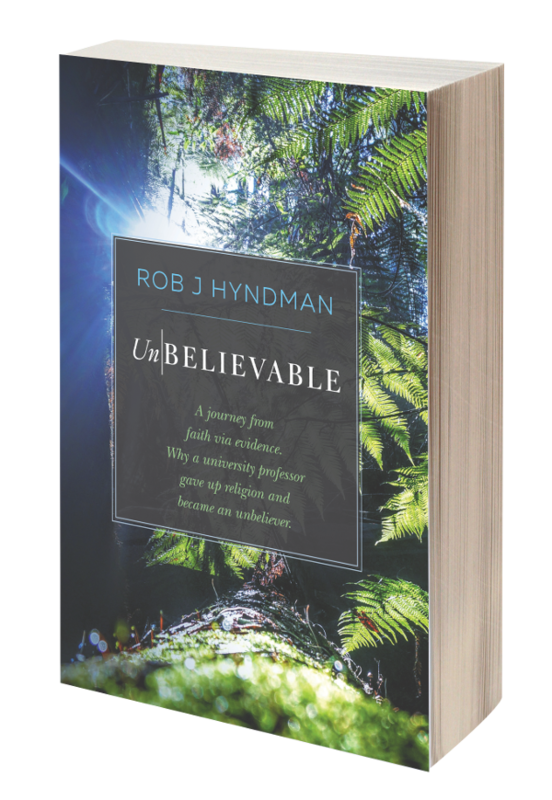 Can an Atheist be a Fundamentalist? Clearly not in the way that the word was first used! 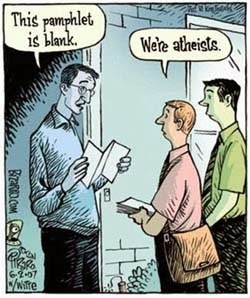 But do Atheists assent to a set of beliefs that they all must share to be accepted into the atheist community? Firstly Atheism is not a belief or set of beliefs – it is merely a lack of belief. As many have pointed out even Christians are Atheists in relation to all but one of the gods that have been or still are worshipped by humankind. Atheists as commonly understood just go one God further. Secondly apart the disbelief in gods, Atheists share no common beliefs; they have no common goals, and in fact there isn’t really an “Atheist community”. Finally, when questioned most people who identify as Atheists will admit that Agnostic would be a better description of their position, as they cannot absolutely rule out the possibility of gods, and would change their minds if there were convincing evidence that gods existed! Even Richard Dawkins described this as his position in the “God Delusion”. 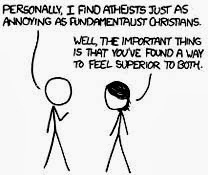 Those who unthinkingly use the oxymoronic term “Atheist Fundamentalism” are always using it in a derogatory way to suggest that Atheists are closed minded and dogmatic. But it is a lazy, untruthful epithet and those who use it show themselves up as ignorant both of Christianity and of Atheism.